MEP – Mechanical Electrical & Plumbing With Fire Fighting. MEP simply denotes the respective services within a building and the designing of the same. Ex – If you take a shopping mall, it will have a Centralised Air Conditioning system, this is where MEP comes in, you find out the effective Tonnage & Air Flow in regard to various factors such as People load (will be taken as an appropriate no. at any given point of time), temperature of the outside environment which will penetrate into the building (mall here) through the wall for which the respective factors will be used in regard to the material used to construct the wall, material used for painting and so on, this aspect of HVAC is considered Designing along with Duct routing – Provide duct routing with the shortest possible pathway with least no of bends, selecting the correct Air Handling Unit etc. Providing this data in detail in respect to the CAD plan is called Drafting. AutoCAD is commonly used. The same can be said for respective Electrical and Plumbing services. Design it in such a way that it will be cost effective with the maximum possible output. I hope you have got a picture of what is MEP from above text, Commonly used software for BIM is Revit MEP, but there are other softwares too. BIM is simply feeding each and every minute detail of the Aforementioned MEP services within a single file. 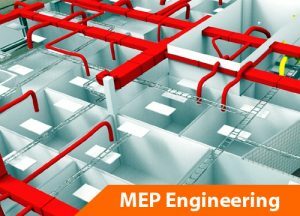 All aspects of MEP and their complete data regarding the services will be fed into this file and will be used to co-ordinate within the services, take the BOQ for purchasing materials, Check if there is any structural or architectural constraints to erect the services (Say duct, piping, cable tray etc). And this all can be performed within this software and hence will speed up the construction process by saving a lot of time, man power ultimately cost effective. These are the Difference between BIM and MEP engineers in Engineering. ← What are the Skills and Knowledge required for BIM Manager?